UnLtd's Big Chat Breakfast Series... Part One. I love taking the opportunity to attend different talks and events in our city. Getting out and about to listen to, talk to and meet new people who I most likely share a common interest with - after all, we find ourselves interested in attending the same events! Although it can sometimes seem challenging to make time and take an hour or two out of a busy day, the chance to gain valuable motivation and inspiration, as well as the opportunity to connect with others is ALWAYS worth it. 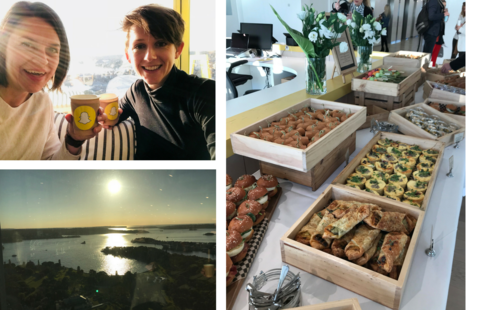 Last week I was lucky enough to head to the Big Chat breakfast series event at the SnapChat offices where I listened to three very different ways technology is being used for good. Now, as a bit of a hot topic of late, I’ve attended quite a few talks, lectures, discussions and presentations within the same subject area, but at each I have happily been introduced to fresh and unique perspectives to solving old problems. Organised by UnLtd, I knew this talk would take a different outlook to those before; a more local outlook on how we can use technology for good. UnLtd is an organisation which harnesses the power of Australia’s marketing, media and creative industries to support charities aiming to support young-Australians in securing a better future for themselves. I know there are heaps and heaps and HEAPS of good causes out there, all of which need our support, and critically our funds to enable them to continue the great work they do. However, as one person, there is only so much aid I can give financially (and of course, I wish this was more). So, the competition between charities can be intense with a limited pool of donors to draw from. Organisations such as UnLtd recognise this. They encourage people such as you and I to see what beyond the cash we can spare and to see the value in the skills we have to offer. Take a look at Part Two of this blog to read about the three awesome presentations made at the Snapchat offices from Missing School, Hear For You and Folo.